Karen Scully found a yummy outlet for her artistic talents when she was downsized in 2015. Since then she's built an on-line community of like-minded creative bakers, and shares some of her best baking tips, creative pie designs, and a delicious chocolate crust fruit pie recipe here. After 27 years of loyal service working in data analysis & reporting at a large corporation, Karen found herself laid off - unfortunately not a unique situation for mature / senior employees and executives these days. What to do? Now approaching her 50+ years, she began exploring new job opportunities and landed several short-term work placements. A few years later, she settled on a full time job as a transportation co-ordinator for Pepsi. In the interim, between jobs Karen was able to indulge her love of creative baking - a seed of interest that was first planted as a child, standing on a chair beside Mom in the kitchen. A side benefit of all this baking while job-searching (aside from the obvious goodies to eat)? "Baking is a great stress reliever"
Several years previously Karen had taken some cake decorating classes and online courses to learn the basics, and was impressed by what she saw other creative bakers do with fondant on cake. She joined a few groups on facebook, bought some tools, and began baking cakes and pastries. Karen began slowly, changing up how her mother and grandmother had created the tops on their pies. A timely visit from two aunts and her mother resulted in a burst of apple pie-making. 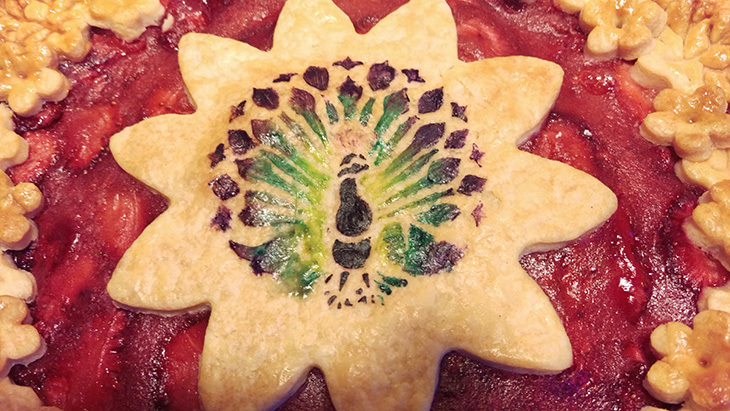 Karen made a free-form flower on her pie crust which spurred a discussion between the ladies about how they all usually made the same design as Karen's grandmother (their mother) had taught them years ago. Now with some extra time on her hands, she was able to unleash her creativity in a new direction, with a focus on pies. "My evolution into pies and making them into designs happened one time when I used a cookie cutter to make my top crust." 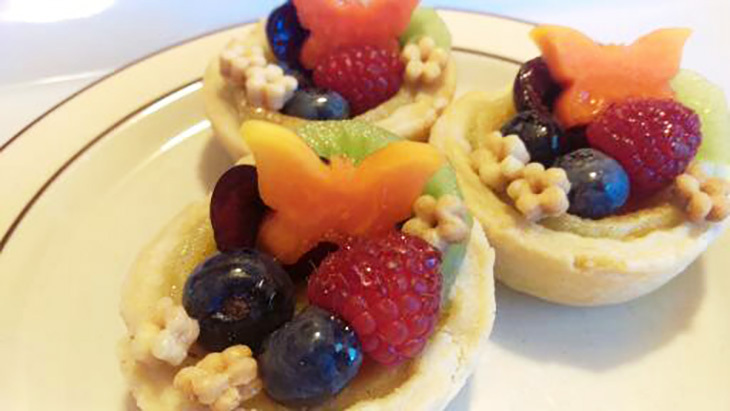 Inspired, Karen began making more creative pie crust tops to her pies using cookie cutters. "It's easier to make cutouts for the top of a crust than it is to put a full piece on it. Pie crust rips so easily and smaller pieces are more manageable. Plunger cutters are fun, as they leave an impression in the dough. It's important to use an egg wash* to make the pieces stick together"
A natural progression was the use of colours in pie dough, but Karen felt a bit lost as she was creating something new with pies. She searched for other bakers that were painting on pie dough, and even asked in cake groups about pie makers. Karen's search was fruitless (unlike her pies! ), so she reasoned if she couldn't find anyone, maybe others would find her. Today her Pie Baking Group page on facebook is a huge pie-making community with over 3,400 members - and growing fast. Although not everyone creates the artistic pies that Karen does, she's made new friends and has inspired other people to make pies. "I want to explore what the limits are on pies. They don't have to be flat. They can be creative. They are art. I also want to share with others so that they can enjoy the experience as well." New members are welcome to join the facebook Pie Baking Group, but it's closed to non-members in order to respect privacy. This also helps these creative bakers to keep their masterpieces a surprise until the unveiling for their final lucky audience of pie-eaters. 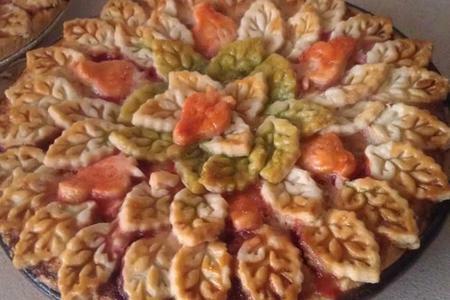 Pies are an artistic outlet for Karen, and can take hours to create. Sometimes the ideas come from her subconscious inspirations, and percolate over weeks before any baking begins. 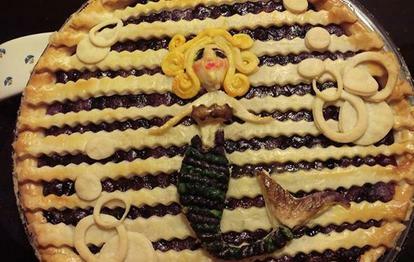 A dream of mermaids resulted in a painted mermaid pie crust topping that aged about 10 years as she baked in the oven. Karen's favourite pie creation thus far is a rose salted caramel apple pie (sounds yummy, doesn't it?). "Pastry roses had failed to keep their shape in the oven for me before. 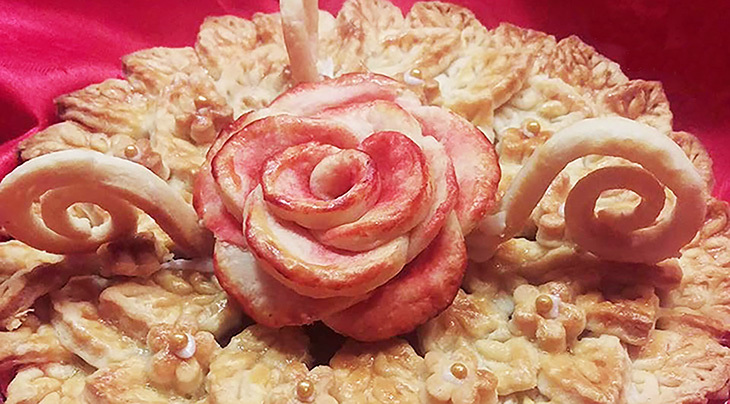 The rose that I made for this pie was baked separately and supported with pieces of foil as it baked." The rose salted caramel apple pie above was donated to a local Farmer's Market event and raised $40 for a local foodbank. 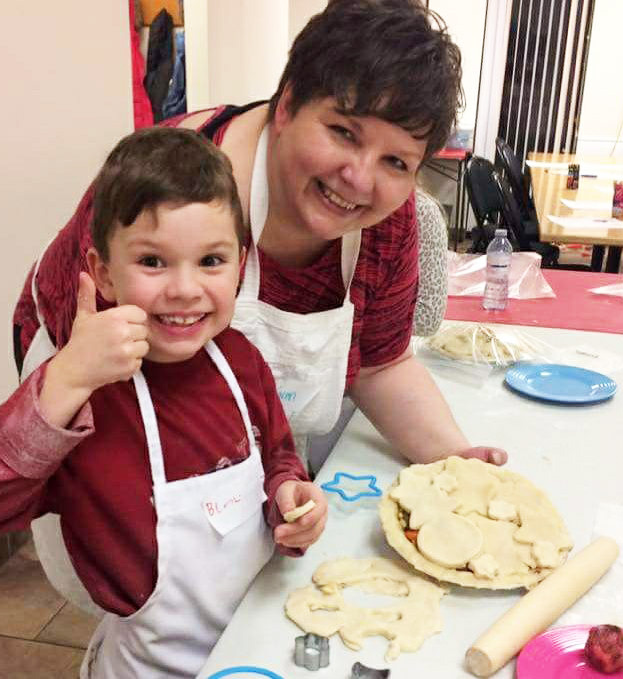 Passing along her skills to the next generation, Karen taught a group of 6 to 10-year-olds how to make pies. Karen doesn't sell her baked creations, as they're her artistic outlet - and how can you put a price on an edible work of art? She's made some unique pies for special occasions - and her husband has been known to abscond with a pie she'd just made to give to new neighbours. Karen will be an apple pie contest judge at the annual Ontario Mulmur Farmer's Market on Oct 7, 2018. Use 1/3 cup of Instant Clear Jel per pie (instead of starch) to thicken fruit pie fillings. It mixes quickly with no lumps, and prevents the filling from running - even after freezing and thawing. Chocolate and cherries or raspberries, are classic combinations that you don't typically find in a pie. Adding cocoa to the crust creates a dramatic contrast when you alternate cocoa pie dough pieces with traditional pie dough. Combine the flour, cocoa, baking powder, and salt. Cut in the lard until the mixture resembles oatmeal. Tip: Karen uses a food processor to cut the lard into the flour. It only takes about 30 seconds to cut the fat into the flour. Transfer this dry mixture to a mixing bowl. Combine the egg and vinegar in a measuring cup. Add enough cold water to reach the 1/2 cup line. Add the egg, vinegar & cold water to the dry flour ingredients. Mix only until there is no loose flour at the bottom of the bowl. Tip: Karen uses a Kitchen Aid mixer on mediums speed for about 30 seconds. Let the pie dough rest in the fridge for about 1/2 an hour or overnight. Tip: Karen puts her pie crust dough in a freezer bag and flattens the dough into a 2-inch disk. Tip: The cocoa dough can break easily, so Karen recommends using a regular pie crust on the bottom. In a bowl, combine sugar, Instant Clear Jel, and salt. It's important to mix the Instant Clear Jel with the sugar before adding the fruit, otherwise it will be lumpy. Add the fruit, chocolate chips, and water (see note above re water). Mix until the sugar mixture is well blended into the fruit. Have fun creating a pie! Use cookie cutters or pizza cutters or make a fun free-hand design. Pie doesn't need to be boring. *Tip: Prepare an egg wash (an egg that is beaten in a bowl). You'll use this later to brush on the pie crust. It makes the top crust shine and helps the different pieces of pie crust stay in place. Set it to one side for later. Roll out your pie dough and line a pie pan with it. Brush the top edge of the pie dough with the egg wash - doing this before you add the fruit pie filling will keep your brush clean. If you forget, you can always do it after. Add the fruit filling, using a stainless steel butter knife (the Instant Clear Jel doesn't stick to stainless) to spread the fruit filling out evenly. Add the top cocoa pie dough crust. Tip: If you're using cut pieces of dough, use alternating pieces to make a pattern. Make sure that the pieces overlap and touch the edges, and brush them with the egg wash to help them stick to each other. Bake for 50-55 minutes at 350°F. *Unless noted otherwise, all photographs on this page are © 2018 Karen Scully / My Way IS the Pie Way. All rights reserved. Do not download or reproduce without written permission. The Next Big Thing for Type 2 Diabetes?